Pick up from airport or your hotel proceed for Miri City Tour that features Malaysia 1st Oil Grand Old Lady located at Canada Hill which is a sandstone ridge overlooking the town and offering excellent views of Miri and the surroundings area. 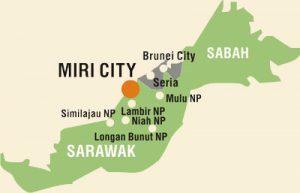 Miri City Fan- a word class urban civic park with the setting of sport, educational and cultural activities, Miri Heritage Centre-handicraft and souvenirs shop and Tamu Muhibbah the local and native market where various tropical fruits and vegetables can be found. Then visit the latest attraction – Coco Cabana, housed World’s only known Seahorse lighthouse, surrounded by sea & Miri Marina, witness platform & oil industry crews getting on/off the jetty as one of the unique feature of oil town. Return to airport or your hotel. Inclusive of: Return transfer from hotels. Petronas Museum not open on Monday.